This week, one of the books my daughter brought home for reading homework was Stone Soup. If you have never read the book, the story is about an impoverished town that comes together to share the small amounts of food they have to create a large and scrumptious kettle of soup. 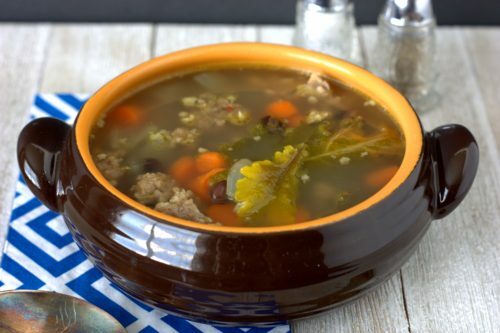 Reading about a “little bit of meat, a little bit of beans, and a little bit of carrots” got me thinking that a hearty soup was just the ticket for this weekend. Not only would I get to use the last bit of kale from my garden, but it also would give me a vehicle to get more beans into the kid’s diet. 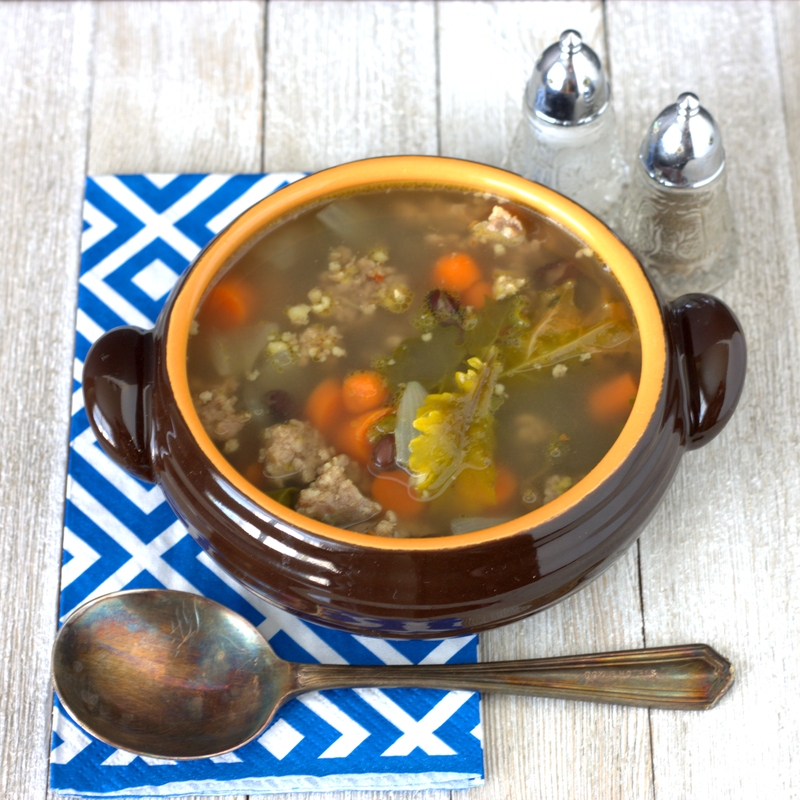 I chose mild Italian sausage as my “little bit of meat” since it would add a lot of flavor. I rounded out the soup with kale, black beans, carrots, onions, and chicken broth. The soup was delicious without being too heavy. The kids thought it was a fun way to bring the book to life. 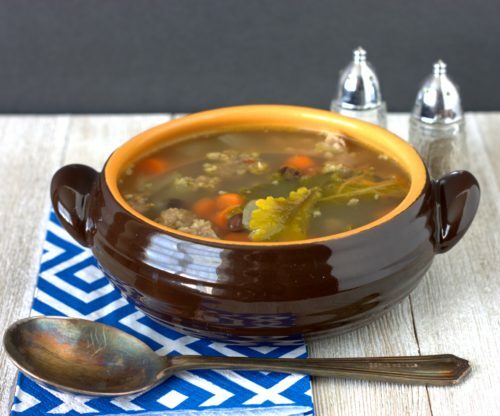 Stone soup never tasted so good! Add the sausage to a large pot and brown and crumble over medium heat. When the sausage is cooked through, add the stock, carrots, and onions. Bring to a boil and add the kale and black beans. Cook for until the kale is wilted, then serve. Refrigerate any leftovers. 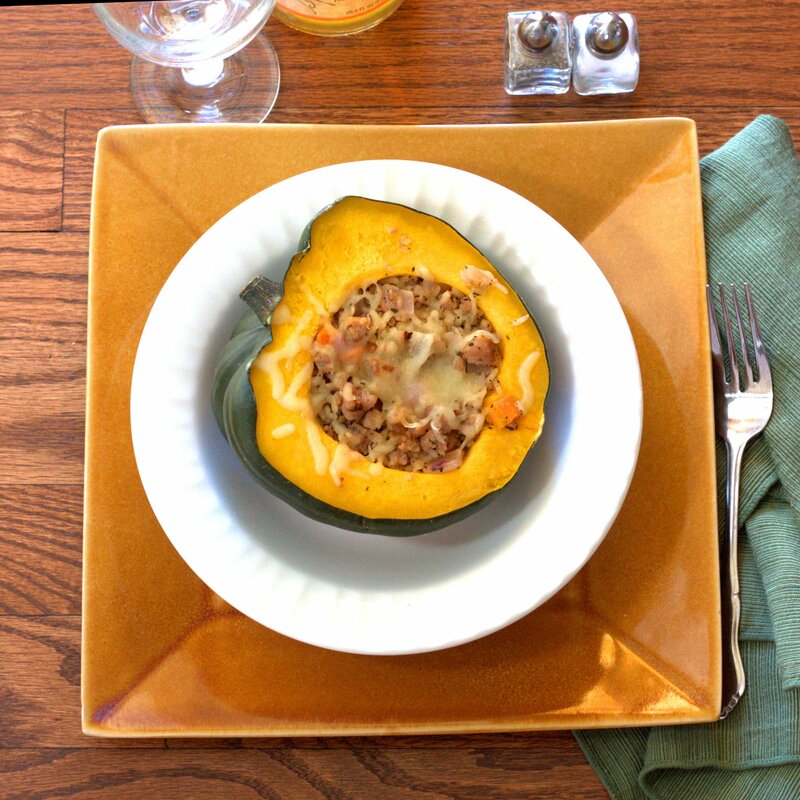 Since I am still trying to eat a variety of vegetables daily (despite the fact that I no longer need to track my vegetable intake for my health benefits program) I decided to make a vegetable full, fall inspired dish – Stuffed Zucchini. 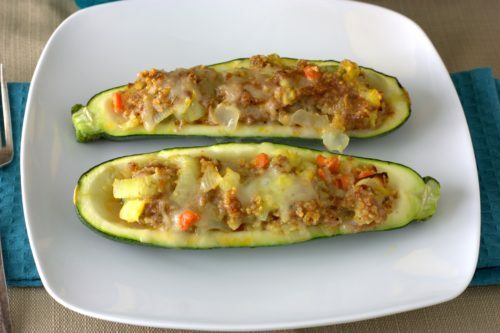 What I love about Stuffed Zucchini (or any other vegetable for that matter, like Stuffed Acorn Squash) is that you can really tailor the recipe to what you have on hand. I went with the classic mirepoix (carrots, celery, and onions) as my main filler outside of the zucchini and pork sausage since I think it adds great color and flavor. You can just as easily omit the extra veggies – it just means your filling will not be as “full” in the zucchini vessel. 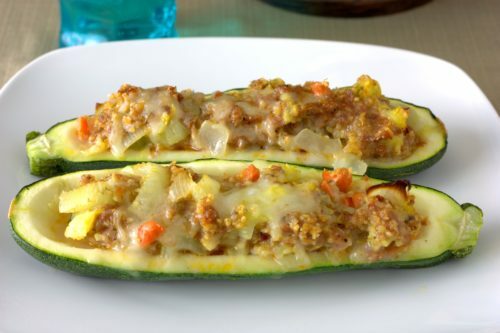 My favorite part about this Stuffed Zucchini recipe is that both my kids ate it without a fuss. Lately they have been picky or crabby and I’m relieved when they eat a good serving of vegetables without a ton of coaxing. I should also mention that it was a hit with my husband. In fact, I had to rush to get some photos in so that he could eat the serving I had set aside for my photography. I count that as a successful dinner! Preheat oven to 375 °F. 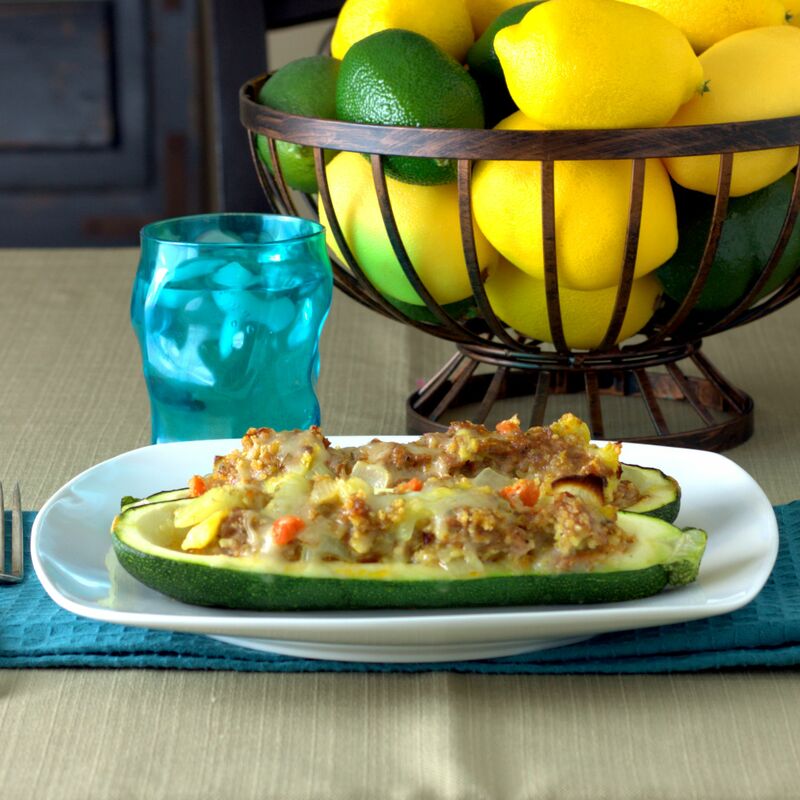 Cut the zucchini in half lengthwise, scoop out the center and dice the scooped out zucchini “meat”. Place a saute pan over medium heat and add oil. Once oil is warm, add the onions and saute for 5 minutes. Add the carrots, celery and diced zucchini and saute another 5 minutes. Remove from the heat and add to a large bowl, along with garlic, pecorino-Romano cheese, breadcrumbs, and sausage and combine until well mixed. Evenly divide between the eight zucchini halves and fill the zucchini cavity. 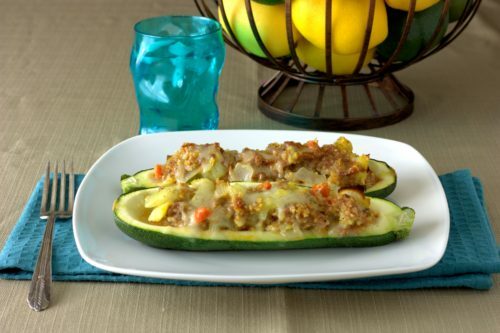 Place stuffed zucchini on a large baking sheet and bake uncovered for 45 minutes or until meat is fully cooked. During the last five minutes of baking, sprinkle with mozzarella and return to oven to melt cheese. Remove from oven and serve. Surprisingly, fall in Colorado has stayed relatively warm. Despite the lack of cooler nights, I have gotten into the fall spirit. Perhaps it is the pumpkin flavored everything you see popping up in the grocery stores, but I felt a squash based supper was in order. Why not celebrate the start of fall with a Bratwurst Stuffed Acorn Squash dinner? 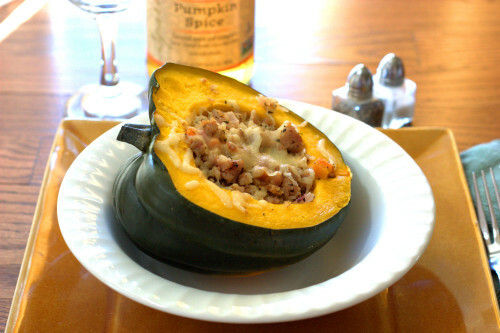 In particular, I thought my kids would get a kick out of the boat-like shape and maybe actual eat more or the acorn squash than typical. I also decided to ramp up the fall fest theme by using uncased, ground pork bratwurst. When combined with the onions and carrots, and seasoned with cloves, fenugreek, and basil the dish perfumed the house with delicious smells and made me want to throw on a sweater to get into the spirit of fall, despite the 85 °F weather. 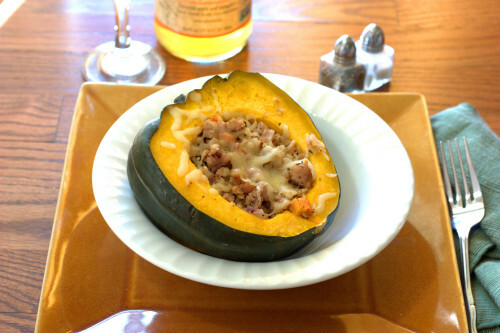 The Bratwurst Stuffed Acorn Squash was a great break from the typical grilled dinners we have been enjoying lately. It also reminded me to occasionally find ways to make dinner fun for the kiddos, especially when trying new foods or ones they haven’t had in a while. Do you have a favorite, kid-fun dinner idea? Preheat oven to 375 °F. 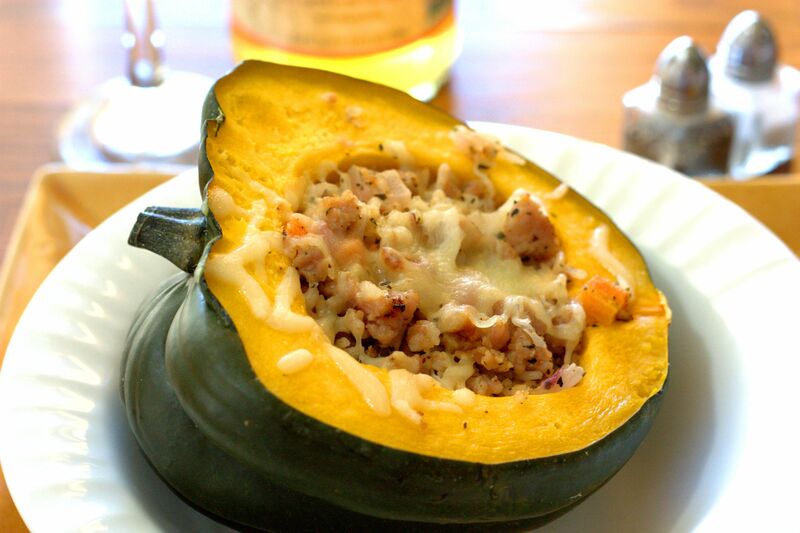 Add an inch of water to a roasting pan and place the acorn squash halves cut side down. Bake for 45 minutes or until squash is tender yet still holds its shape. Meanwhile make stuffing by first frying pork sausage until light brown. Remove pork and add to a large bowl. Melt the butter in the pan used to cook the sausage, then add the onions and carrots and saute them for 3 minutes. Add the rice and stir to coat, then remove from the heat and add to the pork. Add the fenugreek, cloves, and basil to the pork mixture and stir until well mixed. Remove the squash from the oven, turn the squash cut side up and then fill evenly with the sausage stuffing. Sprinkle the cheese evenly over the top of the squash and return to the oven for about 10 minutes, or until the cheese is melted and the stuffing heated through.